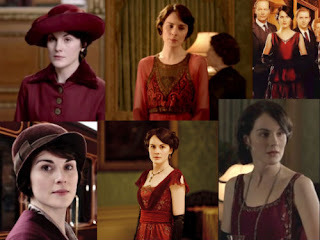 Tomorrow, Thursday 28 June, I'll be on a panel at ACMI discussing Downton Abbey. My particular focus will be on the costumes: how they're sourced; how they reflect character; and how they create an atmosphere of 'historical accuracy' within which the narrative nestles. 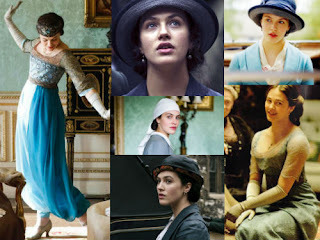 It's the costumes that make a 'costume drama'. I'll be writing up my presentation as an essay for Kill Your Darlings. Here are a few screencaps from my slideshow to give you a taste of what I'll be showing. 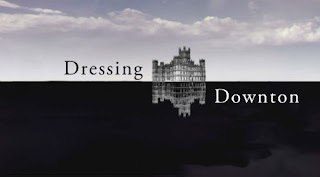 Incidentally, 'Dressing Downton' is also a dressmaking and costuming project spearheaded by The Girl with the Star-Spangled Heart. 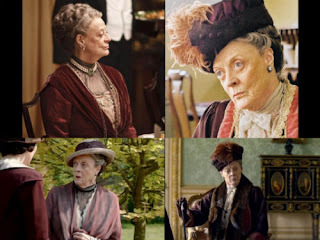 Sewing enthusiasts are invited to blog their Downton Abbey-inspired projects, and you can see pics of their work. What dress size am I? Almost a month ago, I voyaged to Southland shopping centre to participate in a sizing survey being undertaken by Target using 3D body scanning technology. The scanner was travelling to various Australian capital city shopping centres as the retailer collected 10,000 datasets. Haha, guess who's got two 3D-scannable thumbs & is going to Target Southland this weekend to see the 3D body scanner in action? ME! When I mentioned this on Twitter, I was really surprised by the utter confusion and suspicion people expressed about what 3D body-scanning was and how it worked. I thought it was pretty self-explanatory. A machine scans your body and records precise biometric data that you can then use to shop for clothes. Due to me not realising how long it takes to get to Southland on public transport, I arrived there with only 20 minutes before the centre closed, so the blurriness of the phone pics I took reflects the unaccustomed aerobic activity of finding the damn thing in time, as well as my usual shaky hands that mean I seldom manage to take an in-focus photo. Here's the setup. It wasn't in the actual Target store but in the mall itself. As you can see, people of all ages were queueing up to get scanned. You can see one lady holding the little form we had to fill out, in which we listed name, age, race/ethnicity (I wrote "Caucasian/Anglo" and felt like some creepy KKK member), email, phone and postcode. Presumably Target will cross-match those details with its biometric data to build a picture of how body shape varies demographically. We also had to promise not to horse around in the machine, and acknowledge that Target was not responsible for any injuries we might incur in there. Yikes! Here's the little booth. You stand on footprints on the floor and hold your arms slightly out from your body. A vertically mounted scanning bar whizzes in a circle around you once, then makes another pass in the opposite direction, presumably to check its measurements. It takes less than 30 seconds. Then you're done, and you get a printout with your stats on it. But while you're standing there, trying to be very still, you have to look at an unnerving bullseye on the wall of the booth. This mingles unfortunately with people's anxieties over the intimate nature of 3D body scanning, which stem not just from the idea of having your vulnerable body assessed in such a robotic way, but also from most people's only prior experience with the technology – at airport security. The fact we had to decant our personal belongings into what looked like cat litter trays only added to this Homeland Security atmosphere. Let's face it, if any other retailer had done this survey, it would have been instantly far less creepy. Look at all the staff with targets on their backs!! The nerdy guy with the computer was responsible for running the system. I was immensely relieved that I did not receive a visualisation of my body in 3D; just the vital statistics. I've gotta say I felt crushed, though, at the clothing size the scanner told me I should be wearing. Somehow, the fact my size had been assessed by a computer felt much more authoritative and conclusive than if someone had done it with a tape measure. I felt very fat and depressed. I have an entire chapter of my book that examines the way culture teaches us to identify so strongly with clothing size – which is ridiculous, as it is a completely arbitrary and inconsistent system – and to feel such strong emotions of satisfaction and shame based on these numbers. But I also wonder if other people bring that same level of scrutiny and judgment to our bodies that we do to ourselves. I was curious to see if people could 'tell' what dress size I wear simply by looking at me. So last weekend, I decided to ask some sales assistants. Forever New is an Australian chain catering to young women, which offers feminine, sophisticated and slightly retro looks at fast-fashion prices. It is preposterous that I would ever fit into any of their clothes; I only go in there to look at the accessories. The young sales assistant there assessed me as a size 14, but said that the size I took would vary according to style; they have a lot of waisted dresses with full skirts, but also A-line shifts. Sussan has an older, more maternal target market; while still offering fashionable styles and colours, their sizing is more generous and they do a lot of sleepwear. Appropriately, an older, more maternal sales assistant advised me that I would be a "medium to large". Again, she said this would vary on the style I chose, and she said that once I'd found something I liked, she could help me with sizes. This is when I gave up my mystery-shopping experiment. I realised that because sales assistants are trained to make sales, they will always flatter the customer and try to find something in the store to sell them. It's much like the complicated dance of the bra fitter. Even my friends, family and colleagues would feel bad about telling me, to my face, what size they thought I was, because clothing sizes are so psychologically fraught. So I have decided on another experiment: an anonymous survey in which you can tell me what dress size you think I wear. Click here to take the survey – it involves about a minute of your time.